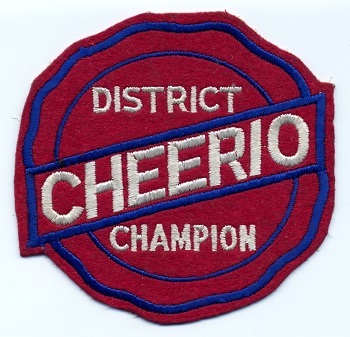 The Cheerio District Champion patch from the 1940s; embroidered design on red felt. This same design was used into the mid 1950s. However, at some point, the felt backing used in this version (felt backing was commonly used among all early yo-yo patches, regardless of brand) was switched to a heavy gauge cotton cloth backing seen here (notice the diagonal weave). A district level yo-yo contest was typically comprised of all the yo-yo winners from contests held in surrounding smaller towns or from playgrounds in the area. It was quite an accomplishment for a young boy or girl to achieve district champion at this competitive level. Patch is 13 cm wide x 12.5 cm tall.